When you need to learn more about your current industry or find a potential business partner for a big deal, LinkedIn gives you tools to do some research. 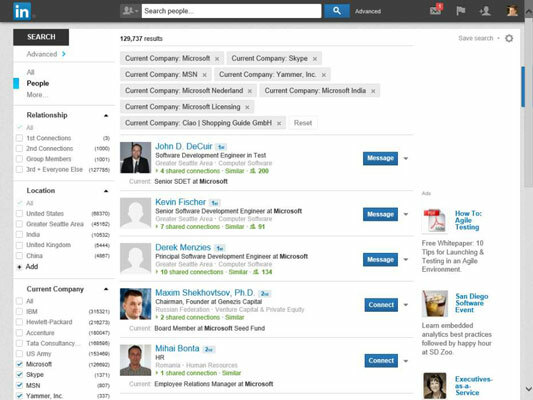 LinkedIn’s Company pages allow users to explore companies of interest and receive company updates and industry news, as well as research each company’s products and services — and, of course, learn about job opportunities the company has to offer. Hover your mouse over the Interests link from the top navigation bar and select Companies from the drop-down list that appears. 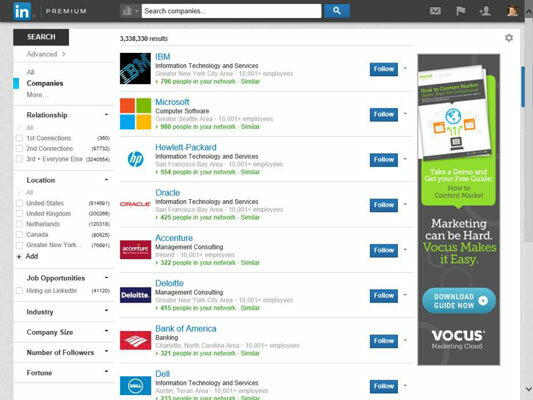 On the Companies page, click the Search Companies link/tab (near the top of the screen). The Companies Search home page appears. LinkedIn automatically shows companies based on the number of people in your network who are currently connected to each company. In the text box along the top of the screen, enter the keywords for your company search. In the left pane, use the Relationship, Location, Industry, and other filters to refine your search. Let’s say you’re looking for an Internet company in the United States where at least one person in your network is employed. If you plan on using any keywords in your search, enter those words first into a search before using the filters to narrow your search. Otherwise, when you enter keywords into the top navigation bar search box, you will automatically reset your search filters, like Relationship, Industry, or Location. Click the Follow button to keep track of that company. When you click the Follow button next to any company listing, you add that company to your list of companies that you are following. 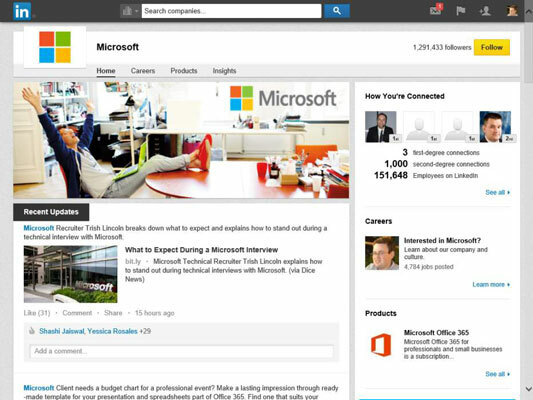 This means you will see all the company updates in the Companies section of your LinkedIn page. View the Company page and study your connections. To see the Company page, either click the name of the company, or click the drop-down arrow next to the Follow button and then click the View link. You can study the information on that page before deciding whether to follow the company. You can also view how you’re connected to people inside the company. On the right side of the page, under the How You’re Connected header, you can see how many people in your immediate network, or first-degree connections, are associated with that company, and by extension, how many second-degree network members you would have at that company. If you click the See All link in that section, you get a list of how you’re connected to people in that company. You can search based on location. Let’s say you’re thinking of moving to a new city and are looking for potential companies to interview with in that city. Click the Location filter and either pick the Region that matches your destination, or click the +Add link and input your city. LinkedIn automatically pops up the region in their database associated with that city. When you see the correct region, click that listing to get a targeted search list of companies in that area. Your search can include multiple locations, so you can select multiple regions, and the results list will include companies headquartered in at least one of those regions. Be aware that if you only want one specific region, you need to deselect your country filter, like United States, for example, and select only the region. Decide who to follow by studying number of followers. 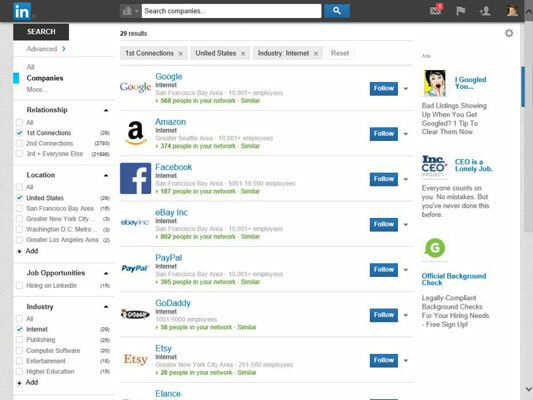 If you’ve got a lot of options for companies, you can use one of the newer filters, Followers, to refine your search based on the number of members who are currently following that company and show you the most-watched companies for your search criteria.